S.M.A.R.T. 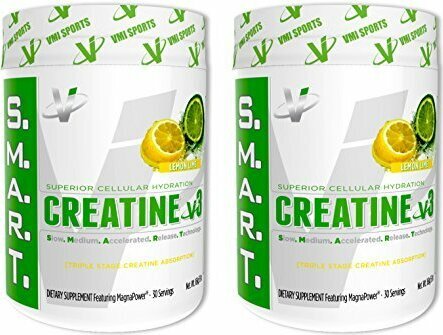 Creatine was Developed to fulfill your muscle building & endurance needs, with one of the most clinically studied ingredients available; Creatine. We made it our mission to develop an advanced formula unlike any other in the market- we thought S.M.A.R.T. Our creatine features the clinically studied, tested & proven MagnaPower Creatine, Creatine Citrate & Creatine Pyruvate. This synergistic combination of creatines allows for a 3 stage digestive release, which can allow for maximum use & uptake by every ounce of your muscle tissue. We didn’t stop there either- we’ve added just enough NaCl, to ensure SKIN TEARING MUSCLE SWELLS. Creatine v3 is a DIFFERENT creatine- it’s not your same old, average monohydrate supplement.We’ve specifically formulated 3 types of creatines, that have REAL human clinical studies behind them for SUPERIOR CELLULAR HYDRATION- all of which, are aimed at different stages of digestion. Creatine Citrate = Immediate Absorption, Creatine Pyruvate = Medium Range Digestion & MagnaPower Creatine= Extended Release Absorption.